Great historians become great not only because of their painstaking effort in mining and locating rare and unpublished manuscripts but also for their ability to evaluate historical records to piece together a rigorous and accurate account of the past. After all, it’s not possible to go back in time, and thus we’re often left with questions like how might we gain access to the past and how might we reconstruct the fuller meanings locked in God’s revealed texts? Most of us who read books of history will lack the necessary analytical skills or capacity (time, budget, stamina etc.) to even contemplate this, let alone attempt it. Consequently, we’re heavy, if not absolutely, reliant on others to do the work for us. In this regard, I cannot think of no other living British Muslim who has served us in this way over the past decade than the author of this book. In his latest addition to the phenomenal trilogy (see The Muslim 100  and The Muslim Heritage of Bengal ) that offers succour to the multitude of identity issues faced by British Muslims, the author presents to us – with much research, breadth and precision, and in a sense brings home to us Westerners living in the present, a window into the long history of Great Muslims of the West. The title of the book is very telling. The author uses “Muslims of the West” as opposed to “Muslim in the West” which we often find various actors somewhat unthinkingly use. “Of” much more emphatically denotes belonging compared to “in” which merely acknowledges presence. The latter, of course, leaves open the possibility for the narrow-minded to argue the presence of Islam or Muslims as something temporary, as passers-by, as opposed to a permanent feature, intrinsic or indigenised to Western. In the introduction, Khan explains the background to writing his book. The problem, as he locates it, is partly in the blurring of individual self-enhancing attitude and interpretation of historical facts, as customary to, what he calls, exceptionalist, essentialist or Eurocentrist approach to history. Consequently, they belie the reality that it was in Europe where some of the most influential Muslim scholars, thinkers and leaders were produced, tracing back to as early as 711. This is a far cry from framing Muslims as apparent “newcomers” to the West in the politics of identity and belonging that rages on today. Secondly, the idea of “Western Islam” has been resisted by some from various Muslim and non-Muslim actors clinging onto narrow or culturally predatory worldviews. In one direction, the perception of an encroaching, universalising Islam obscures the reality that it was never mainstream Islamic thought. Equally, in a different direction, attempts to appropriate “Western Islam” as a means of other-ising or reforming Islam to conform to what often amounts to an imposed secular ‘liberal’ viewpoint have tended to stunt public understanding of Islam and what it has to offer individuals and society on its own intrinsic value. Indeed, the over-arching history of Islam’s contact with culturally different peoples has been remarkably productive, convivial and mutually-assured; one where the emergence of “Muslim” often went hand-in-hand with embracing all that was good or beneficial within cultures. A precursory look at the vibrant and diverse history of cities of Europe such as Cordoba, Granada, Seville, Zaragoza, Malta, Palermo to name a few is proof enough. In this sense, Islam has always settled into the localised contexts and experiences of people as it grew out of Makkah and spread into Europe and America. Broadly, the book sets out to do two things. Firstly, it sets out to bring to us in a condensed, summarised single volume the diverse lives, activities and achievements of some the greatest thinkers, artists, inventors and leaders ever to have lived and contributed to the West. Khan’s preference for this style of synthetic presentation of history pitches at the right level and gives the reader an easy, more holistic picture while still having references to delve deeper. 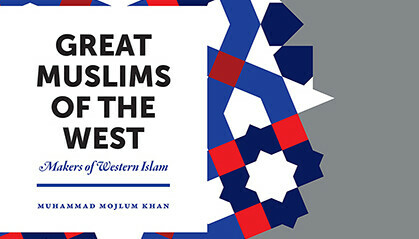 The second objective, which makes it more than a piece of informative synthesis, is that it sets out to instil self-confidence in readers to continue creating Western Islam, by drawing upon the rich legacy, lives and achievements of past Westerners who were proud of being Muslim. Part of this is also to speak to non-Muslims bent on antagonising Muslims (as denoted in “Islamophobia”) because they think Muslims don’t belong to the category of Western. Categorised into three sections, Khan details in all 75 notable individuals of the past who contributed substantially to “Western Islam.” First, “The Early Period” covers 22 figures from Abd al-Rahman I in 729 as the first Muslim ruler of Spain to Evliya Celebi, the great European traveller and author who died in 1605. Understandably, most of the early personalities were Spanish including Averroes (Ibn Rushd), al-Shatibi and Ibn Hazm, not to mention Ibn Firnas (famous inventor), Avempace, less well-known philosopher, and heiress turned literary philanthropist Wallada Bint al-Mustakfi. Beyond that, the figures came from diverse nations, including many from Britain and America and the rest from throughout mainland Europe. It’s a good mix that addresses “Western” in a true sense. By comparison, “The Modern Period” covers 27 personalities starting with the life of Ayuba Sulaiman Dallo (Job ben Solomon) in 1701 to the great Muhammad Ali who died in 2016. The third section, under “Honourable Mentions” covers a further 25 figures, spanning both early and late periods, but in a much more succinct, of one to three-page length. Of course, as Khan confesses, selecting 75 out of the hundreds or thousands was never going to be an easy task. Not least, for example, with only seven women, Khan is cognisant of the question of inclusion, which he rightly acknowledges that though women played a significant backstage role, historical records are quite scant. While each chapter majors on a single personality, Khan does something quite subtle too. In passing, he introduces yet more notable individuals and their contribution to Western Islam. A good example is a chapter titled Ayuba Sulaiman Diallo (1701-1773), where Khan covers a number of other individuals from notable, educated African families who were enslaved in America. Despite that, they produced quite detailed autobiographies and also introduced Islam into the very founding of America. What I found enjoyable in the book is the structure of each chapter, which generally follows a pattern which is exceptionally useful in aiding the reader’s comprehension and interest. Such contextualisation of the life of each person becomes meaningful to the questions of our present times. For example, in covering Lord Henry Stanley of Alderley (1827-1903), who descended from an aristocratic English family and converted to Islam in his twenties, Khan introduces the chapter with questions that explore what it means to be British and Muslim? The author is hinting that in the life of Lord Henry there is an example of a type of non-power implying reconciliation much like Martin Lings (1909-2005) that perhaps remains unexplored today. This model is less evident in the more publically-assertive making of Islam by the likes of William Henry Quilliam (1856-1932) also covered in the book. Each chapter then follows with details about family background before covering major events in the life of each person. All of which Khan highlights in a lucid language with enough detail for the reader to visualise their lives. The book has a very useful chronology, which helps the reader position all 75 personalities to the wider history of Muslim civilisation. There is also an extensive bibliography for further research. Lastly, there is a handy index which helps reveal interesting comparative cross-references between the personalities, aiding the reader to gain a quick appreciation of the rich tapestry of their cross-periodic influences. An example of this is Evliya Celebi (1550-1605) – a figure covered in the first part of the book, who pops-up again when covering Julius Germanus (1884-1979) in the second part. It turns out that Evliya Celebi was a traveller inspired by a dream of Prophet Muhammad, who travelled across Europe documenting what he saw, whose work on 17th Century Turkish Guilds was later translated by Julius Germanus. The author of this book has an encyclopaedic overview of history spanning his previous works. He has a remarkable ability to explain and present history, from which readers can draw insight and learn lessons. I highly recommend this book as a must-have in every home, library, mosque and other educational institutions. It is a good piece of analytical research work.Well done Mr Muhammad Mojlum Khan . We must read it.